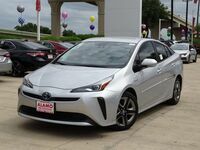 The 2019 Toyota Prius has four trim levels to choose from and they are the L Eco, LE, XLE and the Limited. All four of these trim levels are equipped with an efficient hybrid drivetrain which consists of a 1.8L 4-Cylinder engine and a Permanent Magnet AC Synchronous electric motor. The four trim levels of the 2019 Toyota Prius also provide plenty of interior amenities that will improve your everyday driving. 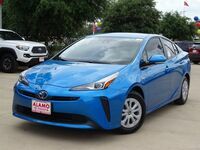 Continue reading to learn more about the performance specs of the 2019 Toyota Prius along with all of its standard and available equipment. What is the Standard & Available Equipment of the 2019 Toyota Prius? 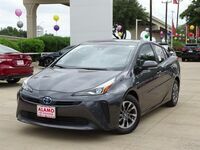 The hybrid powertrain of the 2019 Toyota Prius provides 121 total system horsepower and works with an electronically controlled Continuously Variable Transmission for optimal EPA fuel economy ratings. The L Eco trim level averages EPA efficiency ratings of 58 MPG City/ 53 MPG HWY while the LE, XLE, and Limited receive 54 MPG City/ 50 MPG HWY in standard two-wheel drive. 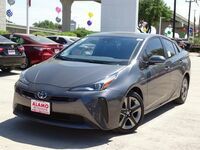 All-Wheel Drive (AWD) is an option for the LE and XLE trim levels and when the hybrid drivetrain of the 2019 Prius works with AWD it averages 52 MPG in the city and 48 MPG on the highway. There is a standard 6.1” touchscreen display with Bluetooth® and iPod® connectivity in the 2019 Prius which help keep important information easily accessible on the touchscreen display. The 2019 Toyota Prius Limited gets equipped with an 11.6” High-Resolution touchscreen with a JBL® audio system and 10 GreenEdge® speakers. The L Eco and LE trims are loaded with fabric-trimmed seats while the XLE and Limited trims receive SofTEx®-trimmed and heated front seats. All four trim levels of the 2019 Toyota Prius have spacious seating for five people and it gives them 93.1 cubic feet of overall passenger volume to stretch out into. There is also a standard 60/ 40 split-folding rear seat in the 2019 Toyota Prius that makes it easy for you to expand upon its 27.4 cubic feet of standard cargo space into the 2nd-row seat. 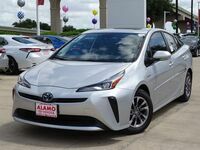 You can take the 2019 Prius for a test drive today at Alamo Toyota to experience its comfortable cabin and top-of-the-line technology features for yourself.